Between 1954 and 2014, JMA recorded an average annual snowfall in the Niseko region of 1,207cm. 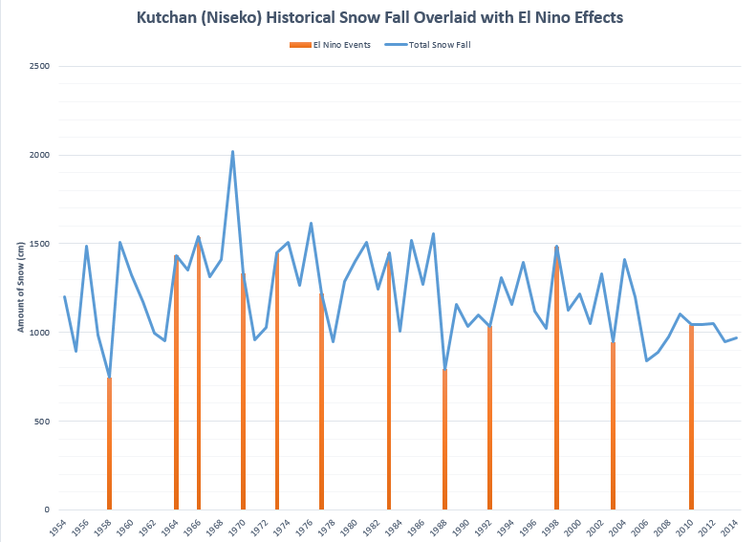 During the 12 El Niño cycles listed below, 5 years had snow fall below the average and 7 years had snow fall above the average, indicating that an El Niño cycle in Niseko is historically likely to produce above-average snow fall conditions. While some El Niño years such as 1958, 1992, 1988, and 2004 show a decline in snow fall during El Niño period, other years such as 1964, 1966, 1972, and 1998 show a peak of snow fall during the weather system. Still other years such as 1978 and 2010 indicate average snow fall during El Niño.